When you choose new floors for your home, you will probably be concerned with characteristics like color, design, and style. You probably aren’t thinking about how your new floor will be installed. While it may not be the first thing you think of, the installation method is actually an important consideration. Your subfloor material may actually influence your flooring choices. Carpet installation is relatively simple. The carpet is usually simply stretched across the floor and attached at the perimeter with tack strips. In some cases, the carpet is glued to the subfloor with adhesive. When it comes to the various types of wood floor, the installation options are much more varied. This installation method is simple, but can be messy. To install glue-down flooring, you apply an adhesive to the entire subfloor with a hand trowel or a roller. The specific adhesive you use depends on the type of floor you’re installing and your subfloor material. No matter what, you should test the adhesive on a small section of your subfloor to make sure there is no reaction before you apply it to the entire floor. This is perhaps the simplest type of floor to install and is the choice for most do-it-yourselfers. Anyone who can use a tape measure and a saw can get decent results with click-lock floating floors. While you can do the job with a hand saw, using a power miter saw will make the job go much faster. This method is commonly used for laminate floor. Because it can go down over nearly any flat, stable surface, click-lock floating floors are ideal for installing over existing tile, vinyl or wood floors. Glue together flooring is very similar to click-lock flooring, but the individual planks are held together with glue. Unlike click-lock flooring, which is held together by the mechanical connection between the boards, the entire flue-together floor is tied together into a single unit. This makes the floor extremely stable and useable even on subfloors that aren’t completely flat and smooth. Finally, there is traditional hardwood flooring, held down with nails or staples. 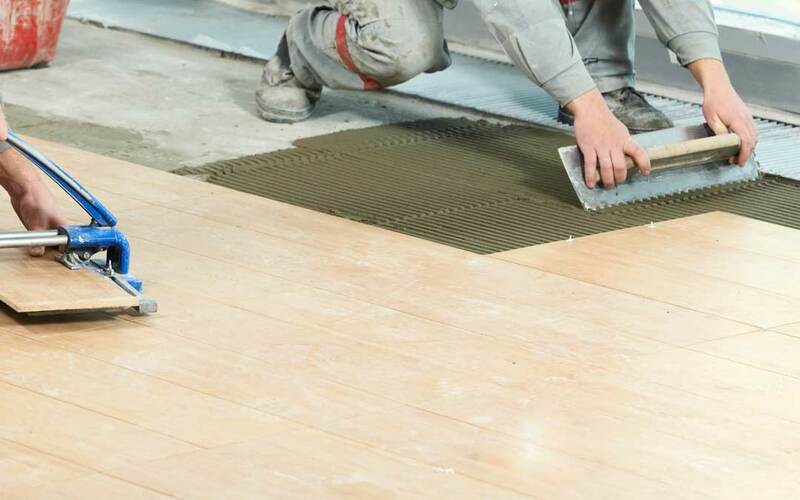 This installation method can be used with both solid flooring, which is milled from actual trees and engineered wood, which is built from multiple layers of wood fibers and often has a veneer surface. This type of floor is only suitable if you have wooden subfloors. If you have a concrete foundation, you’ll need to use a click-down or glue-together floor. Choosing the right floor doesn’t have to be difficult or complicated, but it pays to know your options. If you want to be sure that you’re getting the best floor for your home, give us a call today to schedule your free in-home estimate.